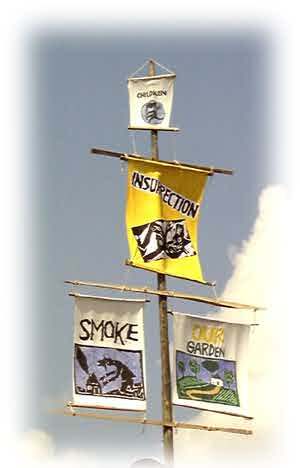 on August, 19th, 1998, it was announced that Bread & Puppet"s Domestic Resurrection Circus and Pageant weekend will not be held anymore. The announcement from director Peter Schumann explains the reasons for the decision. The culmination of troubles was the death of Michael Sarazin on August 8, which makes the continuation of the event impossible. To our neighbors who know the Circus only from the traffic jams on the extended weekends, we apologize for the inconvenience. To our friends and guests we want to say: We are not going away, we will do other smaller forms of theater during the summer months here on the Bread and Puppet Farm. This was a different Domestic Resurrection Circus and Pageant this year. The themes about overcoming tyranny and oppression were the same, but they were harder to interpret. Being au fait with the works of German playwright Berthold Brecht, was a prerequisite for at least a modicum of appreciation. Brecht believed in drama as a tool of social change. He became well known in the 1920's but familiarity with this era is a little bit too much for the "now generation," and others, so many people had difficulty picking up some of the symbolism. It was no surprise, therefore, to see young reporters sent to cover the event (and come up with a story by deadline) quickly latched on to another story...the death of a man in one of the campgrounds adjoining the theater. Despite this criticism, one could argue that the 1998 performances were closer to the kernel of what Bread & Puppet is really all about - decidedly socialist commentary, touched with humor and with a whiff of pure Marxism. Red costumes were prevalent and their was Marx's Manifesto "on display." The weather was hot and muggy on both Saturday and Sunday. People sweltered under a hot sun and some were overcome by the heat which was intense for the afternoon performances and doubtless very uncomfortable for the performers. Peter Schumann, director of Bread and Puppet was obviously incensed by the the behaviour of people who brought dogs and drugs to the festival. At the close of the Circus, he addressed the crowd from atop his stilts and made it clear that Bread and Puppet is no place for brains befuddled by drugs. "Leave your drugs at home," he said. Ambulance crews were reported to have taken about a dozen people to hospital, mostly for drug overdose. Some were treated for heat stroke. And then there was the killing of a man in a nearby campground. It was to spell the end of Our Domestic Resurrection Circus after more than 20 years. Puerto Rican independence, the issue of New York City's community gardens being given protection against future development, the case of Lori Berenson and Berholt Brecht's Three Penny Opera were among the shows we saw (one can never see everything at Bread and Puppet!). The effigy of Uncle Sam towering over the efforts of Puerto Rican independistes was one of the most colorful side shows to be seen. The plainest act, and most easily understood was the Berenson story. The young woman is in a tough Peruvian jail, serving a life sentence for treason after becoming involved with a Peruvian terrorist group. The Peruvian government claims that it was the same group that was responsible for the 1997 hostage taking incident at the Japanese embassy in Lima. The Penny Opera, as it was called, drew a larger than normal audience, probably because it was held in the Pine forest where people could escape from some of the heat. The words for the real opera were written in the 1920s and some say the work was written to "placate the middle-class Germans' fears of working class revolution." In any case, Brecht did not get along with the German government and left for the U.S. How relevant this was to audience in the forest remains to be be seen. As usual the Pageant was obtuse with much symbolism. Even the members of a New York City based theater company, who are regular participants, could not provide an over all interpretation! 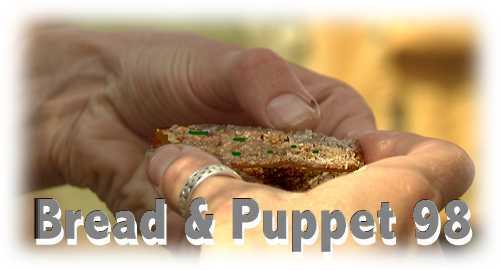 Be sure to check the Bread and Puppet event calendar for future performances.